on Internet sites crowded with similarly addicted fanatics. Even LOST is feeling the heat. The Los Angeles Times notes that CRIMINAL MINDS, which is in the same time slot, is drawing almost as may viewers these days. that ‘Desperate Housewives,’ ‘Lost,’ ’24’ and ‘Grey’s Anatomy’ did,"
formula sells, why genres become generic in the first place. All 22 episodes of the original, first season of BAYWATCH, which aired on NBC, is coming out on DVD on Monday in England. A first season boxed set of BAYWATCH episodes is also coming out on the same day on these shores… only they are entirely different episodes. Confused? I know I was. syndicated season of the show. The U.S. boxed set reportedly has two episodes from the real first season, which they are calling "the lost pilot season." If that wasn’t bad enough, the episodes in the U.S. are also missing the original score. What were they thinking? 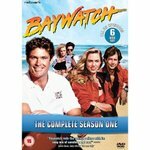 The only reason I care at all about this debacle is because I wrote a bunch of first season BAYWATCH episodes on NBC and, as bad as they were, I wouldn’t mind having them on DVD… so I had to shell out $65 to get the Brit version which, by the way, will only work on a multi-standard player or on your computer. Way back in June 2005, it was announced that Ben Stiller and British comic Steve Coogan were teaming up for a feature film revival of the flop 70s TV series THE PERSUADERS. Apparently, that project has dissolved, because this week Variety reports that the project is now being developed by producer Ashok Amritraj and ANGER MANAGEMENT screenwriter David Dorfman. There was no mention of either Stiller or Coogan’s involvement. If they are gone, it makes the reasoning behind mounting this TV revival a real head-scratcher. THE PERSUADERS starred Roger Moore and Tony Curtis as two fun-loving playboys in Europe who were drafted by a retired judge to solve crimes. The series was produced in England and only lasted a season. But the reruns have a cult following in the UK and France which, apparently, Amritraj thinks is enough to prop up a "tent pole action comedy." But does anyone besides me and a handful of other TV geek still remember the show? …Andrew Dignan analyzes in minute detail the main sequence of THE WIRE, which changes every season. I killed Chadwick Saxelid in the latest DIAGNOSIS MURDER novel, but that didn’t stop him from giving THE DOUBLE LIFE a great review. For the seventh book in his series of Diagnosis Murder tie-ins, author Lee Goldberg has concocted a mystery concept so unnerving, it would even give veteran medical thriller writer Robin Cook the willies. fiction, The Double Life both satisfies and leaves the reader hungry for more. I’m out-of-town, so here’s a second main title for your pleasure…action as only Robert Stack can deliiver it. What would happen if Aaron Sorkin wrote a series about baseball? Emmy-winning writer Ken Levine gives you a brilliant example. GOING NUTS. IT’S GAME SEVEN OF THE WORLD SERIES. There’s more… much much more…and it’s hilarious. I’m sorry you haven’t seen me much around here, but I am currently in Cologne, where I am writing, teaching, pitching and going on helicopter rides (my friends at Action Concept love their helicopters). Over the weekend, I was taken out by an experienced race car driver to Nurburgring, where we drove a BMW M5 on a winding track that’s considered one of the most demanding in the world. When I say "we drove," I mean I sat in the passenger seat while he sped at 240+ km around unbelievably tight turns. I loved it. I thought it was incredibly exhiliratiing. Unfortunately, before I got my turn at the wheel, the car completely crapped out. Somehow we managed to blow the transmission. We had to push the car into a parking spot, where we waited three hours for a tow truck to take us back to the nearest BMW dealership. It was great fun anyway and I got to see a lot of cool cars. Speaking of cars, I also visited the Daimler-Chrysler HQ in Stuttgart, which was fun, too. But the best part of my trip so far has been all the conversations I’ve had with German writer/producers and network executives. I think I’ve learned as much from them as they have from me. The exchange of ideas, methods, and philosophies about writing, showrunning, and the television business has been every bit as exhilirating for me as my high-speed race around the track.